On February 23, 2018, Kyowa Hakko Kirin Co. Ltd and its partner Ultragenyx Pharmaceutical Inc. announced that a conditional marketing authorization had been granted in the European Union (EU) for burosumab (Crysvita) as a treatment for X-linked hypophosphatemia in children 1 year of age and older, and adolescents with growing skeletons. Burosumab is a human IgG1 monoclonal antibody that binds to and inhibits the activity of fibroblast growth factor 23, thereby reducing loss of phosphate from the kidney and other metabolic abnormalities, and ameliorating bone changes that are a hallmark of the disease. The marketing approval in the EU is the first for burosumab. A biologics license application is undergoing review by the US Food and Drug Administration (FDA), and an action on the application is expected by April 17, 2018. On February 27, 2018, Roche announced that emicizumab (Hemlibra®) had been approved in the EU for routine prophylaxis of bleeding episodes in people with hemophilia A with factor VIII inhibitors. Emicizumab, a bispecific IgG4 mAb targeting Factors IXa and X that originated at Chugai Pharmaceutical Co. Ltd., was approved by the FDA on November 16, 2017. On March 2, 2018, Biogen and AbbVie announced the voluntary worldwide withdrawal of marketing authorizations for ZINBRYTA® (daclizumab) for relapsing multiple sclerosis (MS). The withdrawal coincides with an urgent review by the European Medicines Agency (EMA) of inflammatory brain disorder in 8 patients, and follows a 2017 review by EMA of reports of liver injury. Due to the risk of serious liver damage, EMA limited use of Zinbryta to MS patients who had tried at least two other disease modifying treatments and could not be treated with any other such treatments. ZINBRYTA® had been marketed in the EU, US, Switzerland, Canada and Australia. Like this post but not a member? Please join! Membership is free for students and employees of the Society’s corporate sponsors. Emicizumab (Hemlibra, emicizumab-kxwh, ACE910, RO5534262), a bispecific IgG4 mAb targeting Factors IXa and X, was approved by the FDA on November 16, 2017. The drug, which is administered once a week, was approved to prevent or reduce the frequency of bleeding episodes in adult and pediatric patients with hemophilia A who have developed Factor VIII inhibitors. The biologics license application was granted Priority Review and a Breakthrough Therapy designation. Hemlibra was also granted an orphan drug designation by the FDA. Marketing applications for emicizumab are under review in the European Union and Japan; the European Medicines Agency is reviewing the marketing authorization application under accelerated assessment. Emicizumab was granted an orphan drug designation in Japan for the prevention and reduction of bleeding episodes in patients with congenital factor VIII deficiency with inhibitors. The drug was created by Chugai Pharmaceutical Co., Ltd. and co-developed by Chugai, Roche and Genentech. The marketing applications for emicizumab include results from the Phase 3 HAVEN 1 (NCT02622321) study and interim analysis of the HAVEN 2 (NCT02795767) study. In the HAVEN 1 study, adult and adolescent patients (12 or older) who had previously received episodic treatment with bypassing agents were randomly assigned in a 2:1 ratio to emicizumab prophylaxis (group A) or no prophylaxis (group B). The primary end point of the study was the difference in bleeding rates between Group A and Group B. Emicizumab was administered subcutaneously at a dose of 3 milligrams per kilogram per week (mg/kg/week) for 4 weeks followed by 1.5 mg/kg/week up to the end of the study. The annualized bleeding rate in Group A was reduced by 87% compared to Group B (2.9 events vs 23.3 events, P<0.001). The HAVEN 2 study is evaluating the efficacy, safety, and pharmacokinetics of subcutaneous administration of emicizumab in hemophilia A pediatric patients with inhibitors. 1. Oldenburg J, Mahlangu JN, Kim B, Schmitt C, Callaghan MU, Young G, Santagostino E, Kruse-Jarres R, Negrier C, Kessler C, et al. Emicizumab prophylaxis in hemophilia A with inhibitors. N Engl J Med. 2017;377(9):809-818. doi: 10.1056/NEJMoa1703068. The Antibody Society maintains a comprehensive table of approved antibody therapeutics and those in regulatory review in the EU or US. As of November 16, 2017, a total of 10 mAbs have been granted first approvals in either the US or EU in 2017, and marketing applications for a total of 9 antibody therapeutics that have not yet been approved in either the EU or US are undergoing review in these regions. Not a member? Please join! Membership is free for students and employees of the Society’s corporate sponsors. 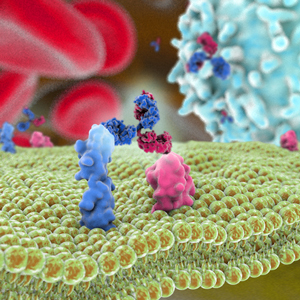 The antibody product landscape is continuously changing : more potent formats including antibody-drug conjugates and bispecific antibodies are on the rise (1). Although the concept of bispecifics has been known for more than 30 years, many technical challenges have only been resolved in recent years, resulting in bispecifics in different flavors entering the clinic. Numerous platforms, each with their own specific functional characteristics and manufacturing requirements, have led to two approved bispecific antibody products, catumaxomab and blinatumomab, and >50 bispecific antibody products in clinical evaluations (Figure 1). Roughly, the landscape of bispecific antibody platforms can be divided over 3 major classes: fragments, symmetric and asymmetric antibodies. Products representative of all 3 classes have reached the stage of clinical evaluation (Figure 2). Multi-targeting approaches, including bispecifics, are generally being recognized to address disease heterogeneity and therapy escape. We believe, however, that the real excitement in the field of bispecific antibodies comes from the ability to couple two (or more) specificities, thereby introducing novel functionalities that were not present in the parent molecules. This class is also termed “obligatory bispecifics” by Spiess et al (2) and Labrijn et al (3). Well-known examples of obligatory bispecifics, and the most validated use, are CD3 bispecifics, which activate T cells solely when bound in close proximity to a target-expressing cell, resulting in specific and effective tumor-cell killing. The two clinical approved therapeutics, catumaxomab and blinatumomab, belong to this class. Another example of an innovative bispecific application is emicizumab (Chugai), which crosslinks Factor IXa and Factor X and mimics the natural function of Factor VIIIa. This Factor VIII replacement therapy is currently in a Phase 3 clinical trial in hemophilia patients (NCT02622321). Bispecifics can also be used to guide translocation to immune-privileged sites, such as the human brain. Yu et al have described a molecule that binds with one arm to the transferrin receptor, which guides crossing over the endothelium (4). Upon accessing the brain, the molecule binds to its therapeutic target β-secretase (BACE1), resulting in reduction of brain amyloid-β. Recently, Wec et al. presented a very elegant ’Trojan horse’ bispecific approach to target Ebola infections (5). 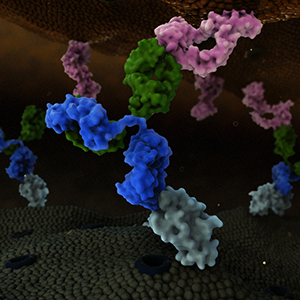 By combining knowledge of the molecular mechanisms of filovirus infection and the availability of mAbs against relevant epitopes, a molecule was generated that binds to a conserved surface-exposed Ebola epitope with one domain, while the second binding domains attacks the receptor binding site within the endosomal compartment upon internalization, thereby preventing viral entry. Some other interesting uses of obligatory bispecifics include enhanced lysosomal delivery of antibody-drug conjugates by targeting lysosomal membrane protein CD63 in combination with a tumor-specific target (6), fixing HER2 receptors in a conformational state (7) and induction of tumor cell DR5 clustering by using simultaneously binding to fibroblasts (8). Taken together, technical progresses in the past years has advanced the development of therapeutic bispecific into the clinic. In particular, obligatory bispecifics offer exciting and innovative treatment opportunities by revealing completely new functionalities. 1. J. Schuurman, P. W. Parren, Curr Opin Immunol 40, vii (Jun, 2016). 2. C. Spiess, Q. Zhai, P. J. Carter, Mol Immunol 67, 95 (Oct, 2015). 3. A. Labrijn, P. W. Parren, Science in press, (2016). 4. Y. J. Yu et al., Sci Transl Med 3, 84ra44 (May 25, 2011). 5. A. Z. Wec et al., Science, (Sep 8, 2016). 6. B. E. de Goeij et al., Mol Cancer Ther, (Aug 24, 2016). 7. C. Jost et al., Structure 21, 1979 (Nov 5, 2013). 8. P. Brunker et al., Mol Cancer Ther 15, 946 (May, 2016). T-cell recruitment for the treatment of cancer has garnered substantial interest over the past thirty years [1,2]. In this type of therapy, activated tumor-specific cytotoxic T-cell lymphocytes are directed to malignant tumor, and subsequently destroy them. Activation of this mechanism relies on T cells and tumor cells being in close proximity to one another. One popular strategy for bringing the cells together involves use of a bispecific antibody  where the dual-antigen specificity can enable simultaneous binding of a tumor-specific antigen along with an antigen present on a cytotoxic T-cell. In addition to having the advantage of enhanced functionality compared to a monospecific antibody, garnering dual specificity from single-agent therapy can simplify the development process, e.g., only one molecule needs to be approved. Two bispecific antibodies that take advantage of this principle have been approved: catumaxomab (Removab®) for the treatment of malignant ascites secondary to epithelial cancers and blinatumomab (Blincyto®) as second-line treatment for B cell acute lymphocytic leukemia (ALL). Catumaxomab is a monoclonal IgG-like antibody . It is termed trifunctional because one of the Fab arms binds epithelial tumor cells via the epithelial cell-adhesion molecule (EpCAM) antigen site, the other Fab arm binds cytotoxic T cells via the CD3 receptor, while the Fc acts as the third site of action, selectively engaging Fcγ receptor I-, IIa- or III on accessary cells. Thusly in this strategy, tumor cell destruction relies not only on T-cell lysis, but also on T-cell activation of accessory cells such as macrophages, dendritic cells and natural killer cells, which engage in destruction of tumor cells by various mechanisms such as perforin-mediated lysis, antibody-mediated phagocytosis and cytokine release. In 2009, catumaxomab became the first bispecific antibody to be approved, for use in Europe . Blinatumomab, in contrast, is a bispecific T cell engager (BiTE) . It is composed of two tandem single-chain variable fragments, each with unique specificity, fused together by a short flexible linker. One arm of this bispecific molecule binds CD3 on T cells while the other arm binds CD19, an antigen found on almost all B-lineage ALL cells and in many places throughout B cell differentiation. Bridging of the two antigens enables T-cell activation and exertion of cytotoxic activity by lysis of target B cells. Two advantages of this bispecific molecule are its small size, which results in fast systemic clearance and ensures close proximity of T cells to target cell, and its flexibility, which is thought to lead to efficient induction of T-cell activation by enabling optimal interaction with target epitopes on the two opposing cell membranes. In some cases, bifunctionality is preferred over trifunctionality because of concern that the Fc receptor interactions could potentially lead to dampening of the immune response. In 2014, blinatumomab became the first bispecific antibody approved for use in the United States. It is currently being evaluated in Phase 2 clinical trials for the treatment of other ALL-related diseases . Nonetheless despite very encouraging preclinical results [7-9] and extensive clinical activities [10-13], additional successful outcomes in the clinic have not been forthcoming. Of the twenty novel bispecific antibodies that entered first-in-humans clinical studies in 2014-2015, approximately half invoke a T-cell recruiting mechanism. Despite this abundance, none of these have advanced beyond Phase 1. Thus far, toxicity and lack of significant anti-tumor response appear to be the primary barriers to advancement of these agents. Improving the selectivity of T-cell activation is being examined as a way to address toxicity issues. To increase the effectiveness of the agents, alternate dose administration strategies are being tested. For example, blinatumomab’s dosing was changed to continuous infusion instead of intravenous injection to ensure continuous activation of T cells against target cells . In addition, use of T-cell recruiting bispecific antibodies as first in-line treatment or as a component of combination therapies are also being evaluated to determine whether significant gains in patient response can be achieved. If such gains can be achieved with these approaches, more T-cell activating bispecific antibodies that will successfully meet patient needs may be available in the future. 1. Staerz UD, Kanagawa O, Bevan M. Hybrid antibodies can target sites for attack by T cells. Nature 1985; 314:628–31. 2. Perez P, Hoffman RW, Shaw S, Bluestone JA, Segal DM. Specific targeting of cytotoxic T cells by anti-T3 linked to anti-target cell antibody. Nature 1985; 316:354–6. 3. Weidle UH, Kontermann RE, Brinkmann U. Tumor-antigen–binding bispecific antibodies for cancer treatment. Seminars in Oncology 2014; 41:653–60. 4. Linke R, Klein A, Seimetz D. Catumaxomab: Clinical development and future directions. mAbs 2014; 2:129–36. 5. Wolf E, Hofmeister R, Kufer P, Schlereth B, Baeuerle PA. BiTEs: bispecific antibody constructs with unique anti-tumor activity. Drug Discovery Today 2005; 10:1237–44. 6. Turner J, Schneider S. Blinatumomab: A new treatment for adults with relapsed acute lymphocytic leukemia. Clin J Oncol Nurs. 2016; 20:165–8. 7. Deo YM, Sundarapandiyan K, Keler T, Wallace PK, Graziano RF. Bispecific molecules directed to the Fc receptor for IgA (FcαRI, CD89) and tumor antigens efficiently promote cell-mediated cytotoxicity of tumor targets in whole blood. J Immunol 1998; 160:1677–86. 8. Löffler A, Kufer P, Lutterbüse R, Zettl F, Daniel PT, Schwenkenbecher JM, Riethmüller G, Dörken B, Bargou RC. A recombinant bispecific single-chain antibody, CD19 x CD3, induces rapid and high lymphoma-directed cytotoxicity by unstimulated T lymphocytes. Blood 2000; 95:2098–103. 9. Heiss MM, Ströhlein MA, Jäger M, Kimmig R, Burges A, Schoberth A, Jauch K-W, Schildberg F-W, Lindhofer H. Immunotherapy of malignant ascites with trifunctional antibodies. Int J Cancer 2005; 117:435–43. 10. Begent RH, Verhaar MJ, Chester KA, Casey JL, Green AJ, Napier MP, Hope-Stone LD, Cushen N, Keep PA, Johnson CJ, et al. Clinical evidence of efficient tumor targeting based on single-chain Fv antibody selected from a combinatorial library. Nat Med 1996; 2:979–84. 11. Burges A, Wimberger P, Kümper C, Gorbounova V. Effective relief of malignant ascites in patients with advanced ovarian cancer by a trifunctional anti-EpCAM× anti-CD3 antibody: a phase I/II study. Clin Cancer Res. 2007; 13:3899-905. 12. De Gast GC, Van Houten AA, Haagen IA, Klein S, De Weger RA, Van Dijk A, Phillips J, Clark M, Bast BJ. Clinical experience with CD3 X CD19 bispecific antibodies in patients with B cell malignancies. J Hematother. 1995;4:433-7. 13. Heiss MM, Murawa P, Koralewski P, Kutarska E, Kolesnik OO, Ivanchenko VV, Dudnichenko AS, Aleknaviciene B, Razbadauskas A, Gore M, et al. The trifunctional antibody catumaxomab for the treatment of malignant ascites due to epithelial cancer: Results of a prospective randomized phase II/III trial. Int J Cancer 2010; 127:2209–21. 14. Klinger M, Brandl C, Zugmaier G, Hijazi Y, Bargou RC, Topp MS, Gökbuget N, Neumann S, Goebeler M, Viardot A, et al. Immunopharmacologic response of patients with B-lineage acute lymphoblastic leukemia to continuous infusion of T cell–engaging CD19/CD3-bispecific BiTE antibody blinatumomab. Blood 2012; 119:6226–33.